WINNIPEG – The newly formed line of Milan Michalek, Jason Spezza and Ales Hemsky combined with goaltender Craig Anderson‘s 46 saves to push the Ottawa Senators to a 5-3 win against the Winnipeg Jets on Saturday. Three assists from Hemsky, whom the Senators acquired Wednesday from the Edmonton Oilers before the NHL Trade Deadline, tied his career high. Spezza had three assists, and Michalek had a goal and an assist. The win pulled the Senators (28-25-11) to within four points of the Detroit Red Wings for the second Stanley Cup Playoff wild-card spot in the Eastern Conference. Ottawa wrapped up a four-game road trip 2-2-0. The Michalek-Spezza-Hemsky trio could provide the Senators a strong first line as they push for a postseason berth. Playoff hockey has eluded Hemsky since the Oilers’ run to the 2006 Stanley Cup Final. After consecutive losses to the Oilers and Calgary Flames this week, Senators coach Paul MacLean put his team through a 90-minute practice Friday. “I thought we played harder as a team in all aspects of the game, and that’s what we need to do,” MacLean said. “Can we play harder? Yes. We need to still play harder than we did tonight, but it’s a really good place to start. The Jets (30-28-7) are on an 0-2-1 slide at home and remained three points behind the Dallas Stars for the second wild-card berth in the Western Conference. 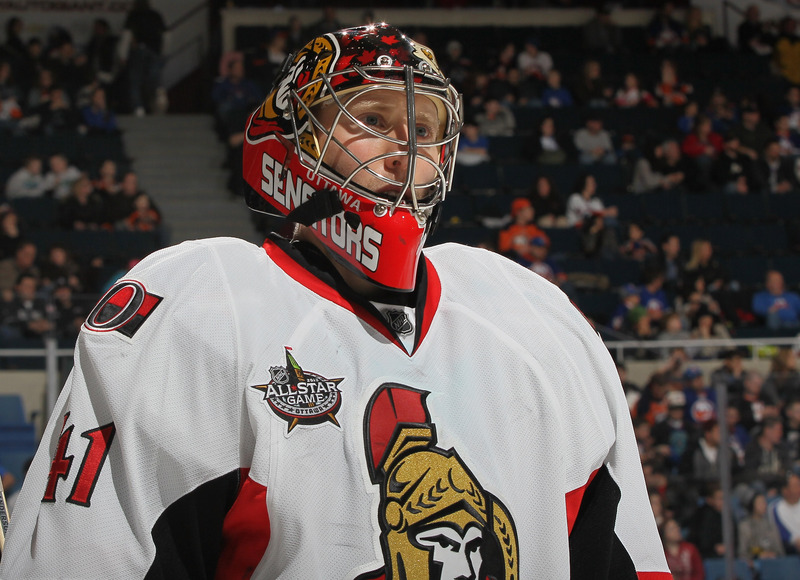 Anderson started his fourth consecutive game and stopped 21 of 22 shots in the third period. Winnipeg goalie Ondrej Pavelec started for the fifth straight game and made 15 saves before Ottawa’s fifth goal 9:36 into the second period ended his afternoon. Al Montoya made 12 saves in relief in his first game since Feb. 8. Michalek opened the scoring with his 10th goal of the season before Jets center Bryan Little‘s 20th, on a power play, tied the game. The Senators answered 38 seconds later on Jared Cowen‘s fourth goal. Ottawa scored three second-period goals to break open the game. Eric Gryba‘s second of the season moved the Senators’ lead to 3-1 at 2:01. Tobias Enstrom got the Jets within a goal 2:14 later with his seventh on a left-point slap shot. Kyle Turris rebuilt the Senators’ two-goal lead with his 21st at 8:58. Another Ottawa power play ended with Mike Hoffman‘s first NHL goal 38 seconds after Turris scored for a 5-2 game. Winnipeg’s Dustin Byfuglien‘s 14th goal, off a slap shot 2:13 into the third period, made it 5-3. The Senators’ road power play ranked first in the NHL entering the game and went 2-for-4. The Jets’ power play, 27th overall in the NHL, scored two goals in a game for the first time since Jan. 25. The Senators power play was on a 2-for-29 skid but awakened Saturday. Shortly after the Senators killed a 1:10, 5-on-3 Jets advantage, and 20 seconds into Winnipeg defenseman Zach Bogosian‘s holding minor, Michalek directed Hemsky’s centering pass off the right side and swatted a loose puck that managed to trickle over the goal line at 9:54. The Jets, stuck in a 2-for-27 slide on their power play, tied the game 1-1 with Ottawa’s Chris Neil off for interference. Little corralled the rebound of Byfuglien’s right-point shot and swept the puck into the net while falling to the ice at 16:59. Cowen’s long left-point shot 38 seconds later beat Pavelec short-side for a 2-1 lead. The goal marked the second time in the Jets’ past two games they have allowed a goal within a minute after scoring. A Hemsky-Spezza rush into the Winnipeg zone led to a collision between Pavelec and defenseman Mark Stuart that set up Ottawa’s third goal. With Pavelec out of position, Gryba won a race to the loose puck and put it in an open net. Jets forward Evander Kane won a draw back to Enstrom, who drilled a rising shot past Anderson at 4:15 for a 3-2 game. Hoffman drove down the right side toward Pavelec before sending a pass into the slot to Turris, who lifted a shot over Pavelec for a 4-2 lead. With Winnipeg’s Devin Setoguchi off for boarding, Spezza sent a left-side pass across the slot to Hoffman, who stuffed it past Pavelec. Though the .500 road trip did not please the Senators, they took solace in finishing it with a win prior to returning home Monday to play the Nashville Predators. The Jets, who are trying to push aside the Stars, Phoenix Coyotes and Vancouver Canucks, face a challenge next week that begins with a road game against the Colorado Avalanche. Trying to reach the playoffs for the first time since 2007, the Jets are 11-5-2 since Maurice replaced Claude Noel on Jan. 12.